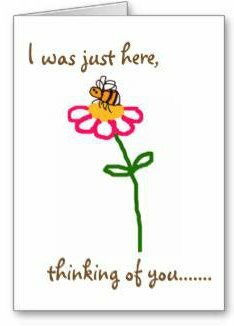 Do Bees Visit Yellow Flowers? Do bees visit yellow flowers? My understanding is that bees like blue and purple. I can't find much information about yellow flowers. I love to see yellow in my garden. Yes, bees do visit yellow flowers! 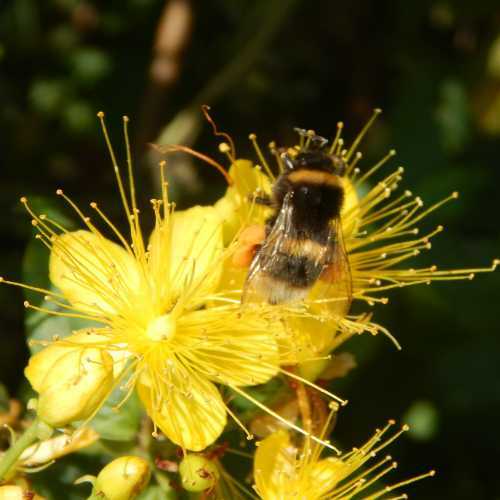 There are many examples of wonderful yellow flowers for bees - including wildflowers, and garden plants and shrubs. 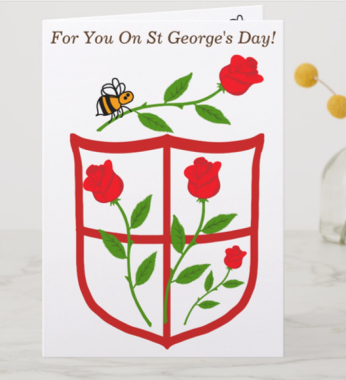 Bees are attracted to flowers offering a rich source of nectar and pollen, and there are plenty of plants and shrubs with lovely yellow flowers that offer bees a rich source of both. 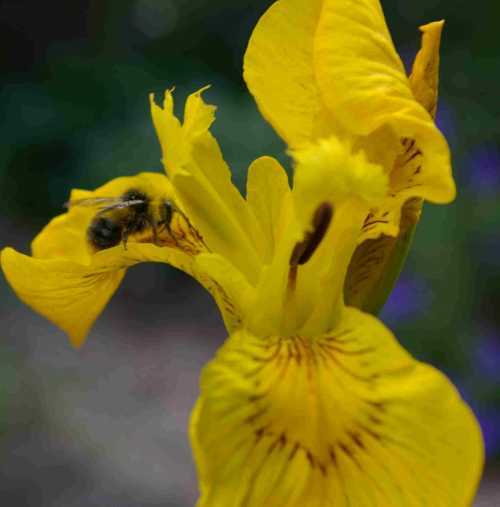 I also love yellow, and have some elegant yellow flag iris, hypericum hidcote, wallflowers and bird's foot trefoil in my tiny garden. Bees love them! 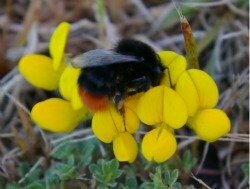 Here are some of my favourite yellow-flowered plants and shrubs for bees - and you'll see from most of the pictures that yes, bees visit yellow flowers! 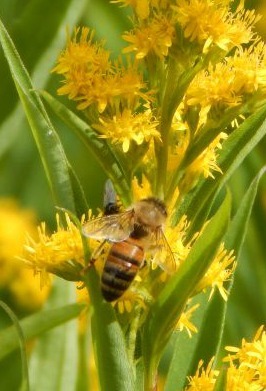 An absolute favourite of mine - Solidago - or golden rod as it is known, is a yellow flower visited by bees of multiple species, as well as many other pollinators. 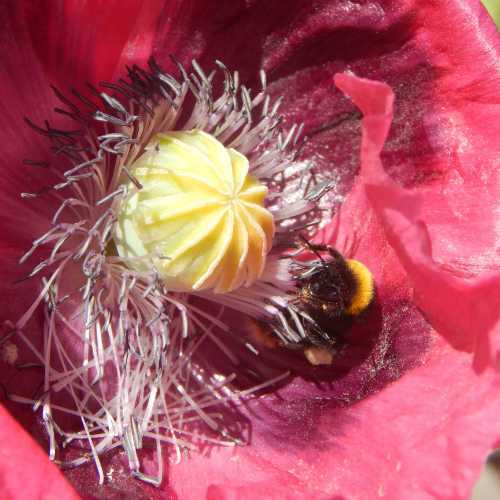 It provides fantastic food for bees when colonies are at their peak, and queens need to feed up for overwintering - i.e. from August onwards. It's also a great plant to include it in the border. I LOVE hypericum! To watch bumblebees land on the bouncy stamens of this lovely flowering shrub, is a joy! I actually mention this among my list of fantastic shrubs for bees. Kale - that's right KALE! Ever since I allowed kale to go to flower on my allotment, I have been converted! 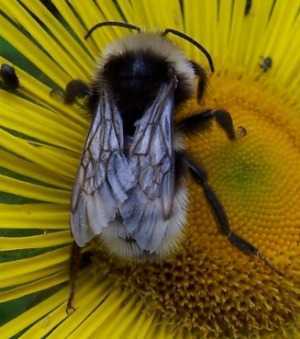 Yet being a vegetable, it gets no serious consideration as a plant for bees. 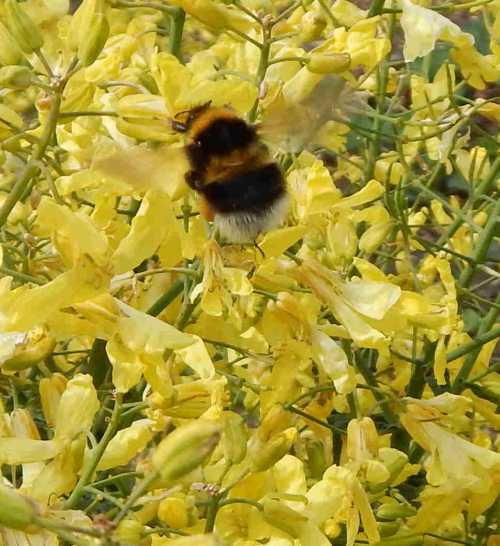 If you allow kale to flower, it will reward you (and the bees) with a bush of yellow, fragrant flowers in spring. A point to note: as well as being bushy, just one plant is a fair size, and they are quite tall. If you are going to allow a couple to flower, make sure they have space. Plant one year for harvesting in spring, then let them flower - you cans still pick some of the leaes to eat. Some people eat the seeds too (or you can plant them) - but I have not tried them. Zinnia come in lots of shades of jewels and pastels, and zinnias are great for bees generally, but if you are looking for yellow flowers specifically - well, they are available, and bees will visit them! Go for the more open variety. Select an old fashioned, fragrant variety if you can, and plant these lovely flowers in a sunny spot. 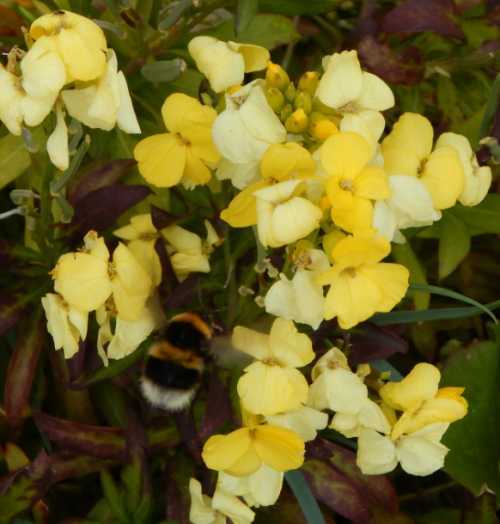 These were growing at my allotment, but I have a different, darker shade of yellow wallflower in my garden at home, and they are visited by bees too. 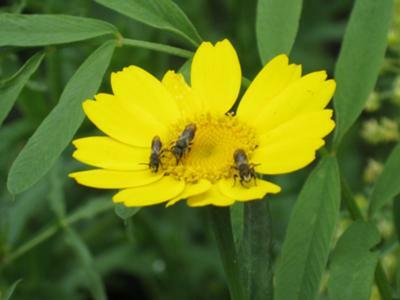 A lovely, vibrant yellow flower loved by bees and other pollinators. Plant in a sunny spot where it will grow about 2 -3 feet tall. Well known for attracting bees, sunflowers are a real favourite with bees - and children. Birds can enjoy the seeds later. It can take a while to establish, but in my experience, it is worth the wait, and then it spreads out nicely. Lovely tall stems and interesting seed pods. Can grow in the pond (where it will spread more vigorously once it gets going) but I also find it works in the border too - actually quite versatile! 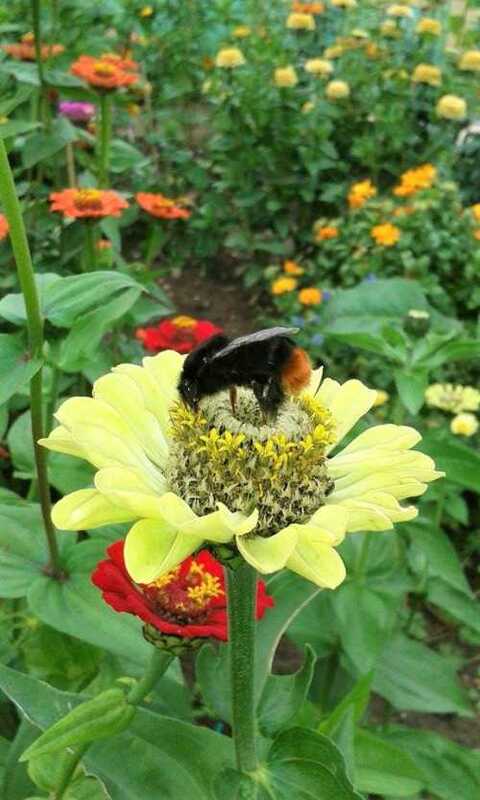 Superb for attracting bees and butterflies, sneezeweed (also known ans Helen's flower) comes in yellow and orangey red. 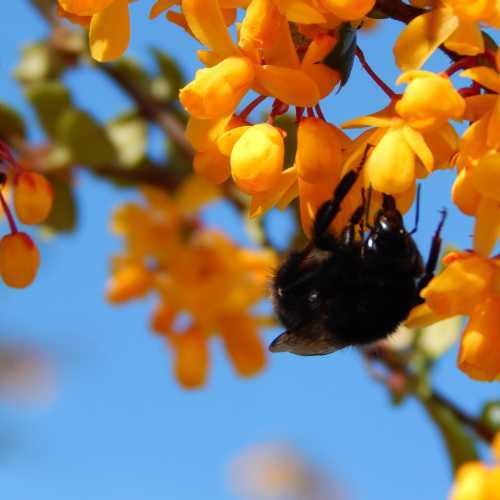 Berberis shrubs provide orangey yellow flowers - popular with bees, and lovely glossy foliage. This shrub is mentioned among my list here. I like bird's foot trefoil in the rockery, but patches can also grown in the lawn (it may go brown in the autumn though - so you need to be aware of this). Corn marigold - a lovely yellow, and loved by solitary bees. 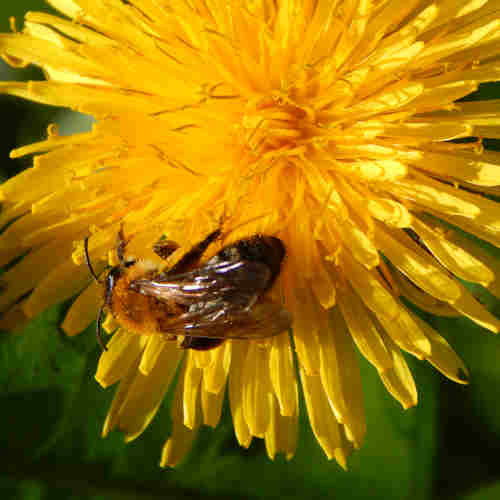 Lots of bees love dandelions, and they can provide much needed food when little else is available. I always let a few survive in my tiny garden, at least for periods when there is little in flower. When the bees are more interested in the other flowers, I pull the dandelions out, confident that mroe will appear the following year or later - and they do! In general would strongly advise you from personal experience: create a garden for bees by all means, but also create a garden YOU and your family love! There are bound to be plants that both you and the bees appreciate.